When was the last time your vacation rental included plush robes, thick towels and sweet Hershey's Chocolate's awaiting you on your bed? With over 7800 sq. feet of incredible space. Huge common area's with tall ceiling and massive wood burning fireplaces. Beautifully decorated bedrooms, two fully equipped kitchens. A game room including pinball, billiards table and 20 foot wet bar for your enjoyment. A place perfect for family vacations, reunions, corporate or church retreats and multi-family gatherings. (Contact us for special pricing for an event or weekend wedding) A unique combination of charm and convenience in a modern converted 19th Century barn. Guests at the Canna Country Inn are always impressed by the spaciousness and comfort of the Inn and the beauty of the grounds. 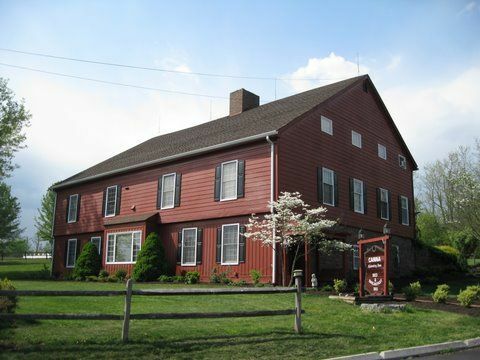 The Inn provides everything you've come to expect from a modern hotel wrapped in 150 years of history! Among the exposed stone and massive wooden timbers are all the amenities you love: air conditioning, cable TV, DVD/CD players, Wi-fi Internet access, hair dryers, private bathrooms, extensive grounds, a large banquet room, large common areas, and 4 fireplaces. An inviting large meeting room with fireplace provides the ideal environment for group or Corporate meetings. After 36 years of marriage we wanted to venture out and work together again. We enjoy the beach, a good flea market and our 4 grandsons. We really enjoy seeing the families get excited about their time together at the Inn. We shopped all over the country to find an Inn we liked. The first time we saw Canna Inn we were excited to find such a spacious and interesting property. It has wonderful common areas for families to relax and enjoy as well a rich history dating back to 1850. Until we moved here , we didn't realize what a wonderful location it was, just a short drive from Harrisburg, Hershey, Lancaster, and Gettysburg. Families can find lots to do or just hang and enjoy the Inn and each other. 18 inch exposed wood beams and stone walls, it is like you are staying in a resort lodge all to yourself 2 full kitchens dining room and large banquet room 2 large sitting rooms, 4 large fireplaces, oversize bathrooms with all the amenities TV/DVD in every room cable TV, fire pit, bar/game room master suite with jacuzzi tub and extensive grounds with creek, walking paths and shaded area with camping area, horseshoe pit, hammock. A gem of a place! A super special find! Perfect for our reunion! Place was great! And beautiful! Plenty of rooms and bathrooms! Very neat and clean! Game room was fun! Kitchen fully stocked! Our reunion of 15 people was so special - in large part due to your special place! Our party of 16 had a phenomenal stay at this home! It was so spacious that adults and kids had plenty of room to spread out during down time but a large enough table that we could all dine together at mealtime. The kitchen was extremely well stocked and the owners were extremely responsive to our inquiries prior to arrival. Thank you so much - hoping to come back next year!! 7 Couples of Lifelong friends who gathered at Canna for the 10th consecutive year; We had a wonderful 10th Anniversary together! The Canna Country Inn is like an old friend to our group of 14 people. Dan and Susan make us feel like family. Do yourself a favor...stay at Canna and you'll be drawn back again and again. There doesn't have to be a special event; Canna becomes the reason why you return. Come alone...come together with a gathering of friends. Canna is a wonderfully restorative place to refresh your soul, year after year. Ruffners are real pros and great to work with. We had an amazing time at the house. It can accommodate so many people, so comfortably! So many great areas to hang out. It was in great condition, and the owners were super helpful and quick with any questions we had. I definitely would come again.